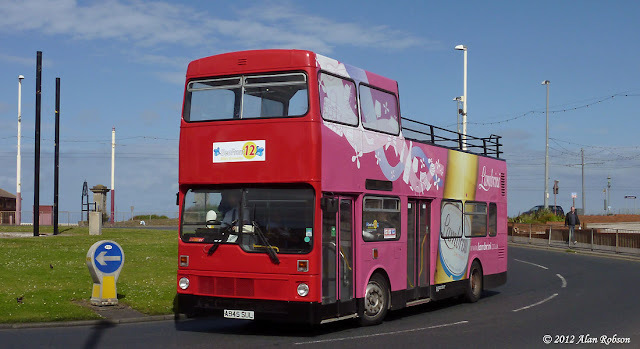 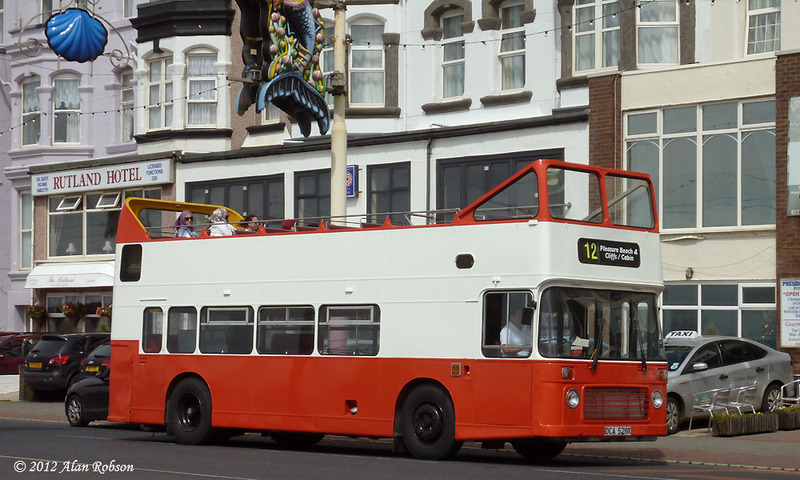 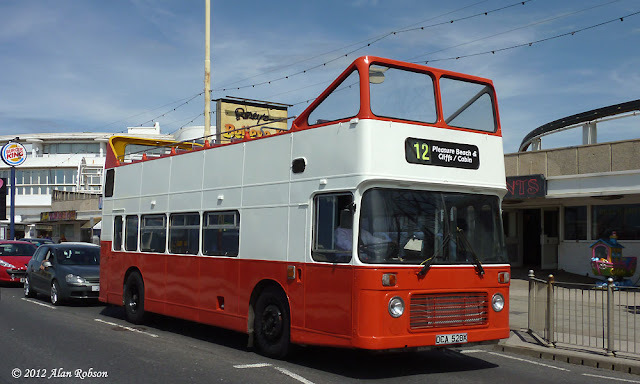 Newly repainted with a red front, former London Transport MCW Metrobus A945 SUL has joined the operational fleet of buses on the Seafront 12 service in Blackpool. A945 SUL previously ran in open-top form for City Sightseeing in Scotland, before becoming part of the Classic Bus North West fleet. look very similar apart from the centre section below window vinyls. Flexity 014 was noted in service today with the new Pleasure Beach advert that was applied a few days ago, which features a photo of the Big One roller-coaster on the centre section of the tram. 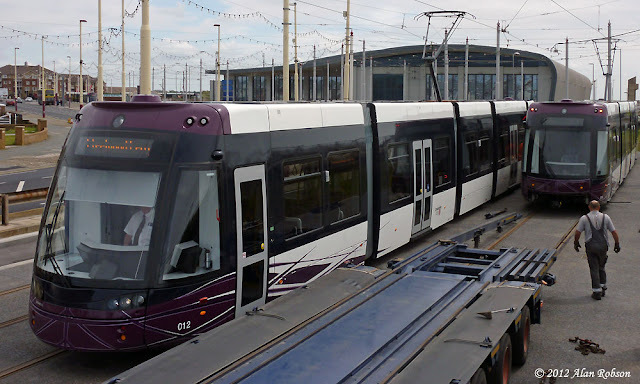 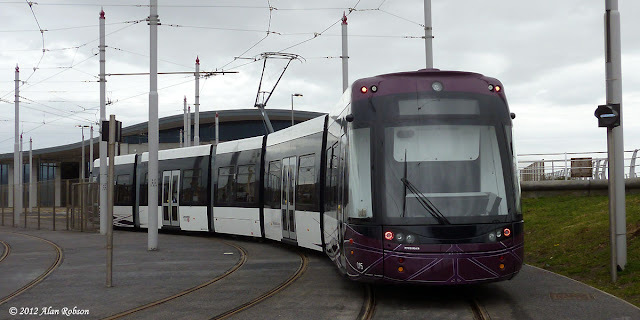 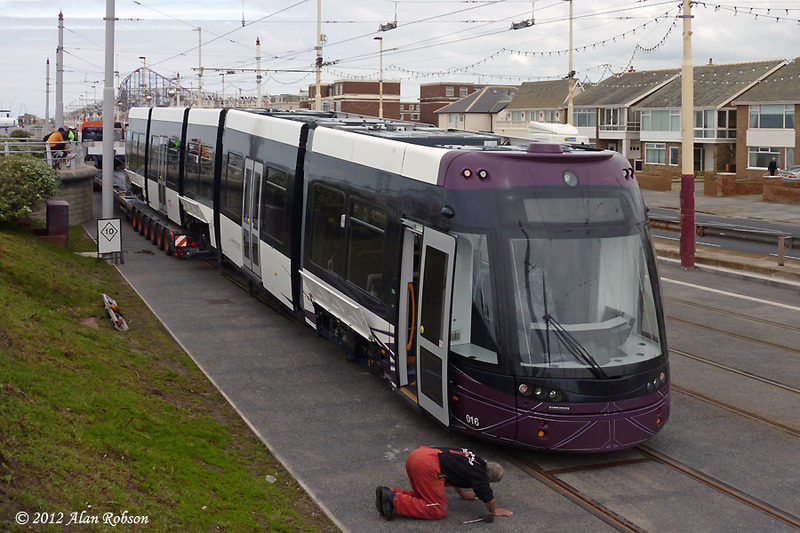 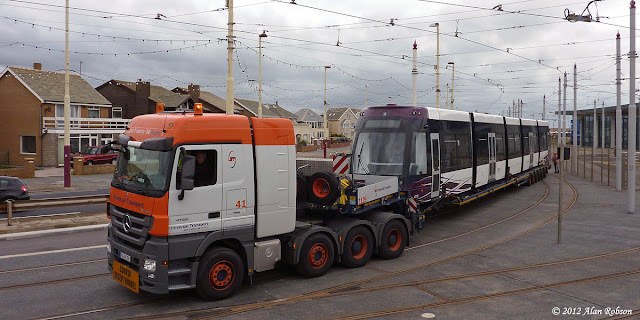 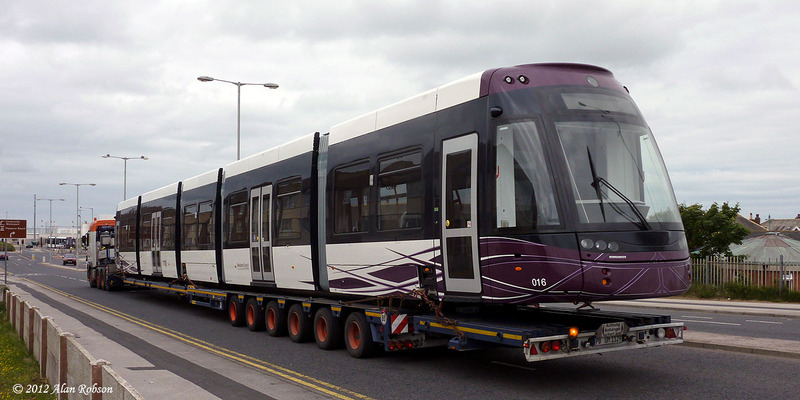 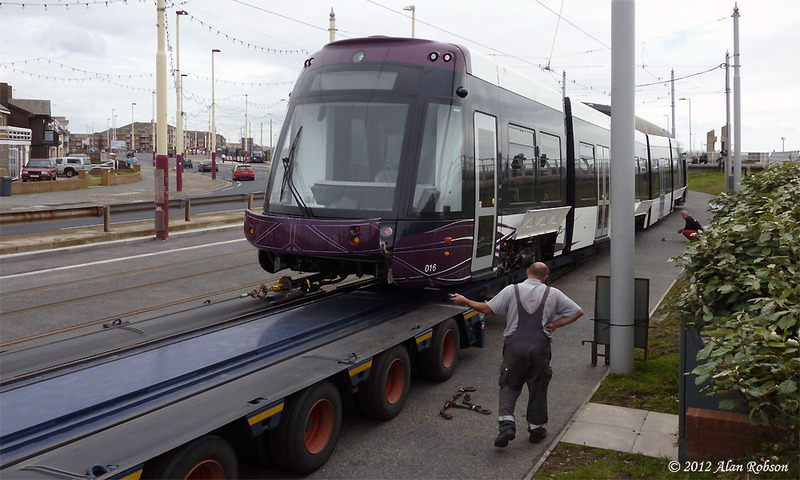 The last new Flexity 2 for Blackpool was delivered today, when 016 finally arrived two days later than originally planned, having been delayed twice since its arrival at Hull docks on Saturday. 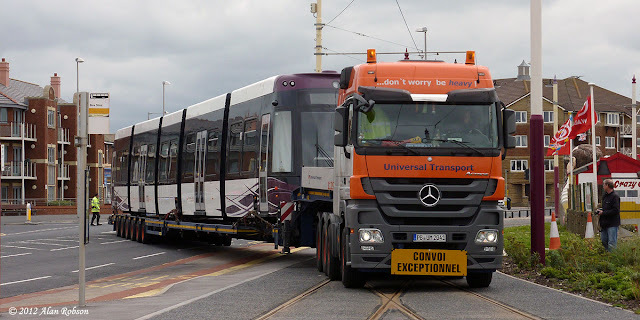 016 crested the railway bridge on Squires Gate Lane at 1230, bringing to a close the delivery of the sixteen Flexity 2 trams, although 002 still has to be returned from Bombardier after being sent to Germany for rectification work on 12th May. 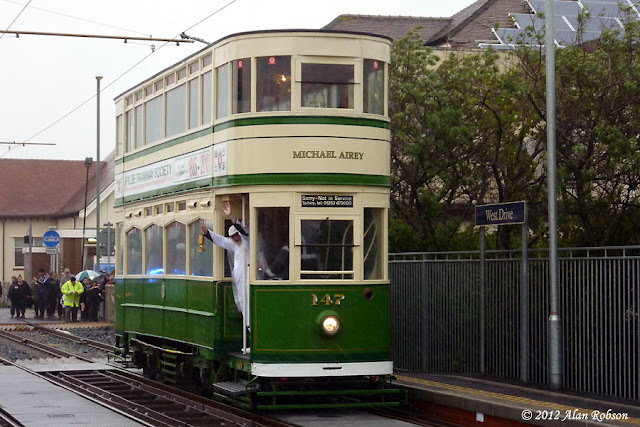 After a slightly longer than usual unloading, due to having to back the brakes off on each wheel first, 016 was finally driven into the depot at 1430. 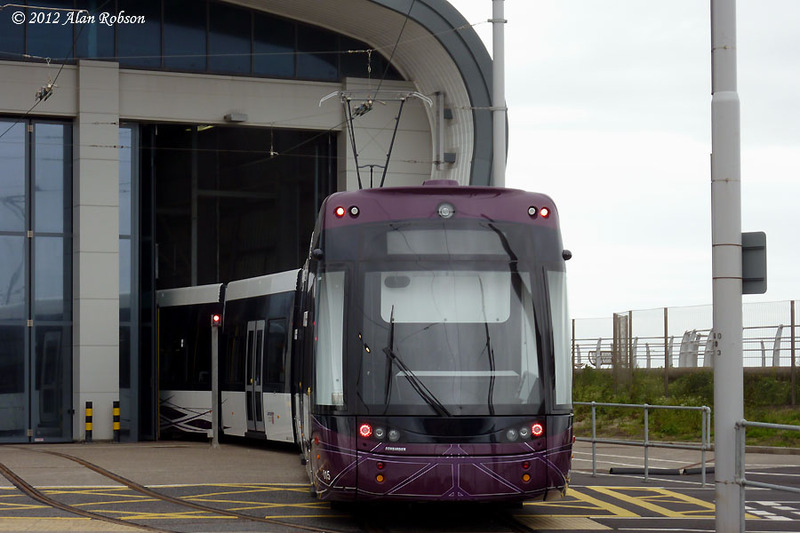 The fourth Flexity to carry advertising, and the third advert for the Pleasure Beach, was noted while Flexity 014 was being shunted around the depot complex this morning. 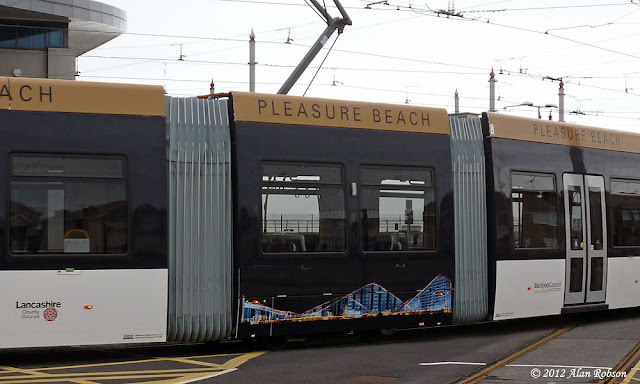 The roof panels on 014 all carry the words "Pleasure Beach", while the lower centre section vinyls show a picture of the Big One roller-coaster floodlit at night. 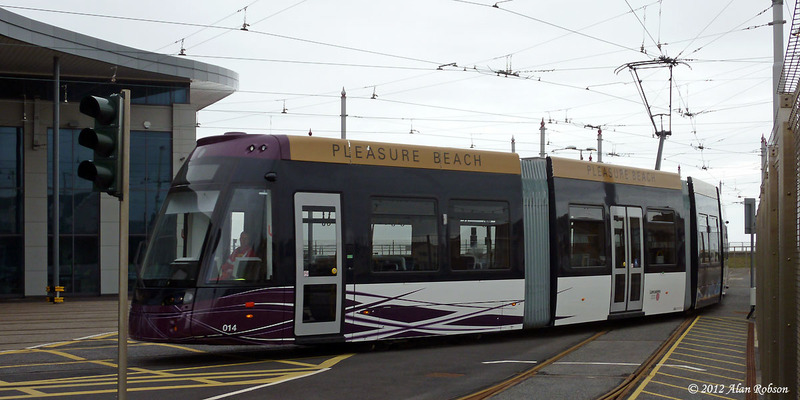 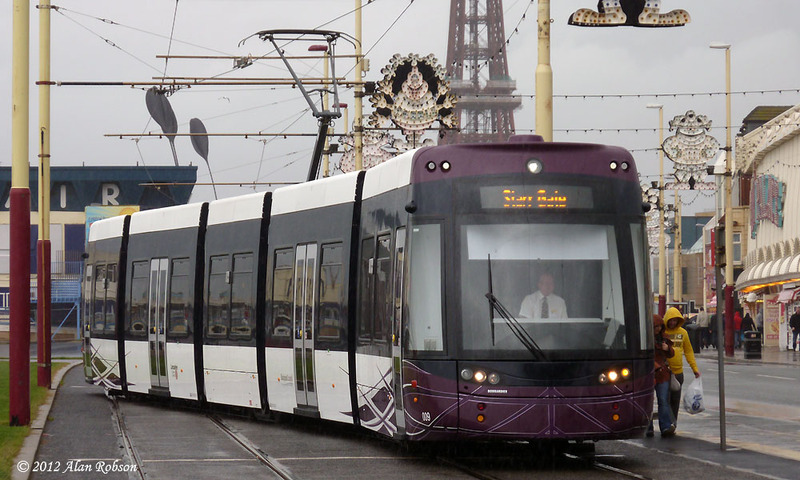 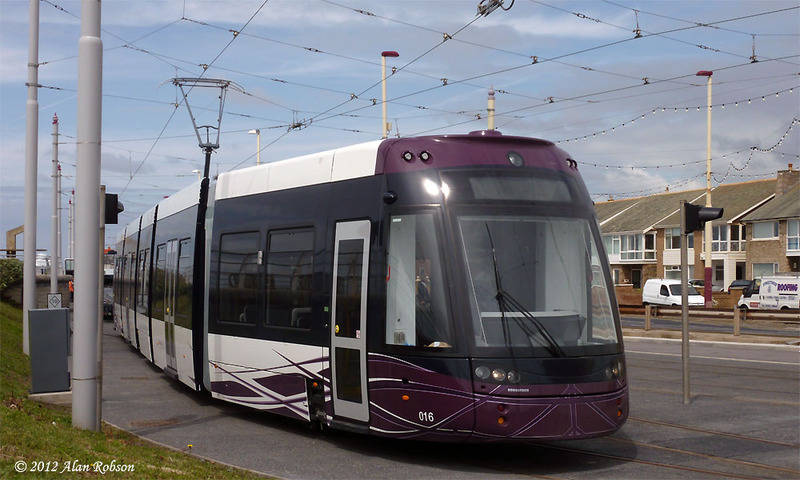 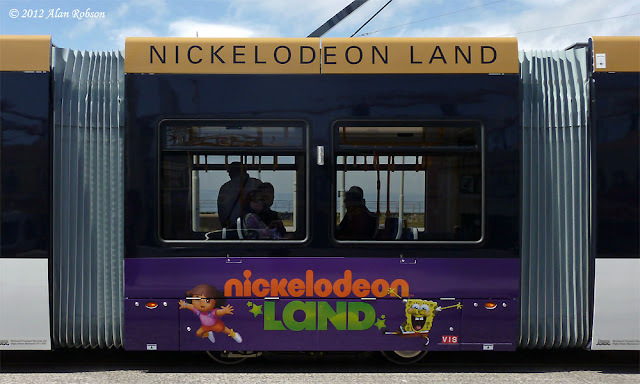 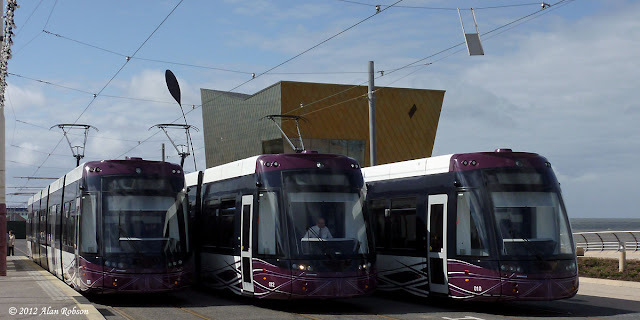 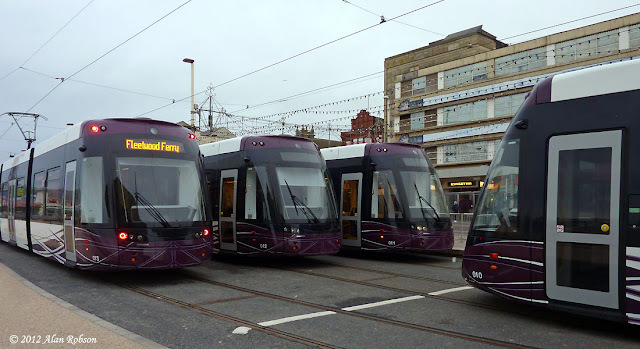 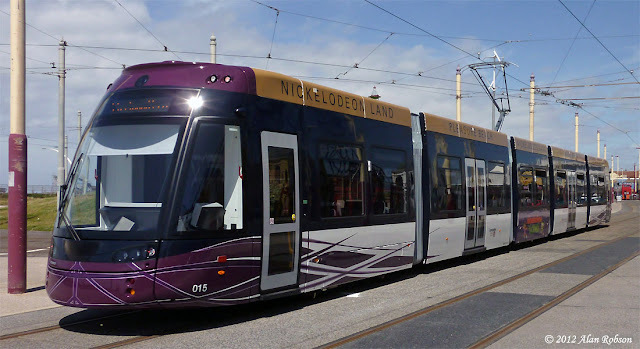 Blackpool's newest Flexity 2 tram, which managed to arrive virtually unnoticed on Friday 8th June, made a short foray onto the promenade this morning. Flexity 015 was spotted on the head shunt around 1145, with full vinyl branding and fleet numbers now applied, it quickly vanished back into the depot again to be stabled on the first maintenance road. 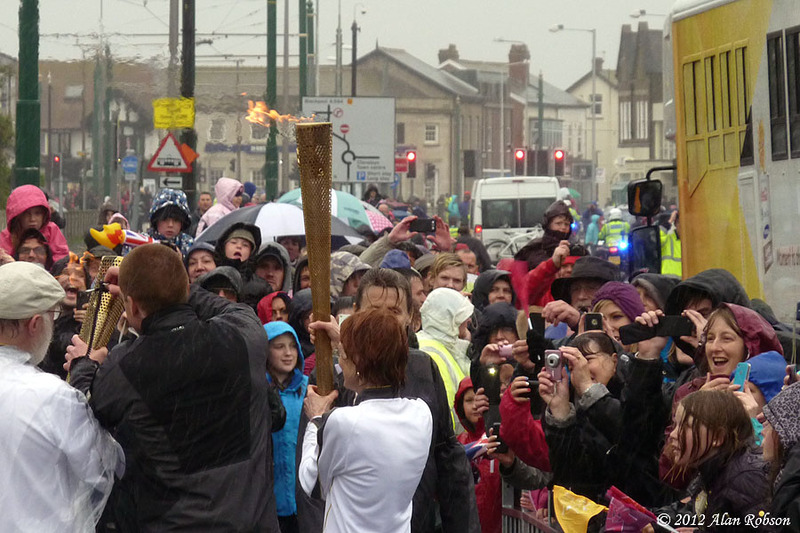 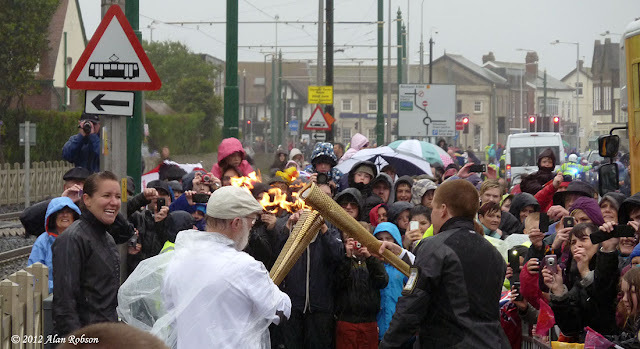 The Olympic Torch procession was greeted on the Fylde Coast today by driving rain and strong winds, as have many other events this 'summer'. 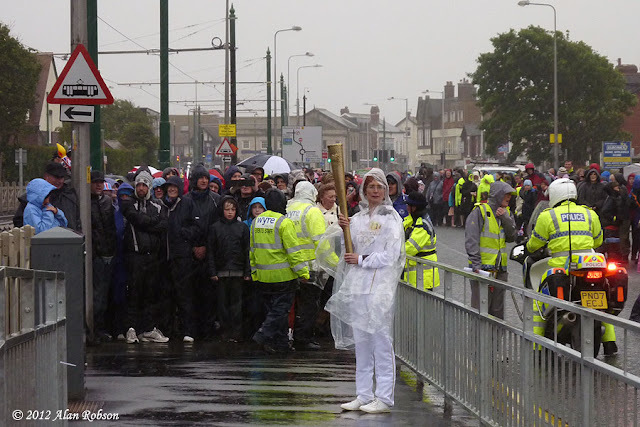 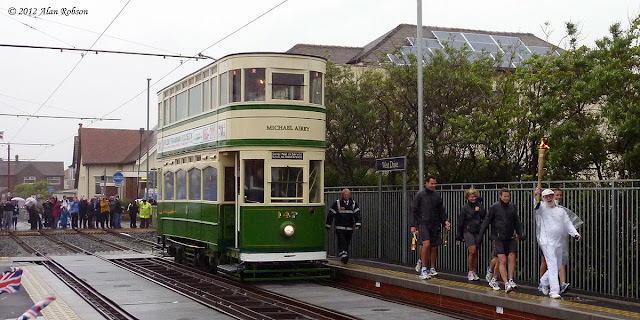 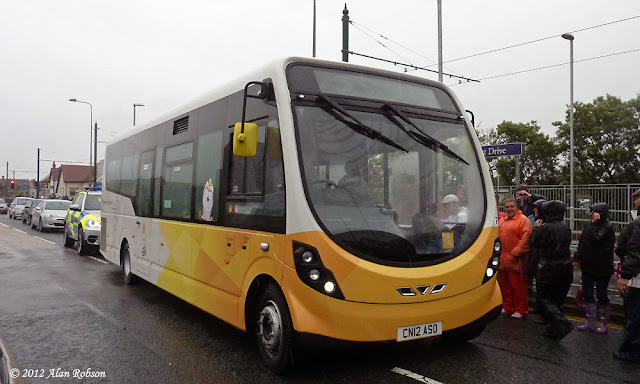 Part of today's relay was to include a tram ride for the Olympic Flame from Rossall School to West Drive in Cleveleys. A boat car had originally been selected for this job, but due to the atrocious weather conditions on the day it was wisely decided to use Standard 147 instead. The Olympic Flame made the journey on 147 inside a miner's lamp for safety, being transferred to the Olympic Torch when the tram arrived at West Drive at about 1705. On leaving West Drive tram station the torch bearer transferred the Olympic Flame to the next runner's torch. 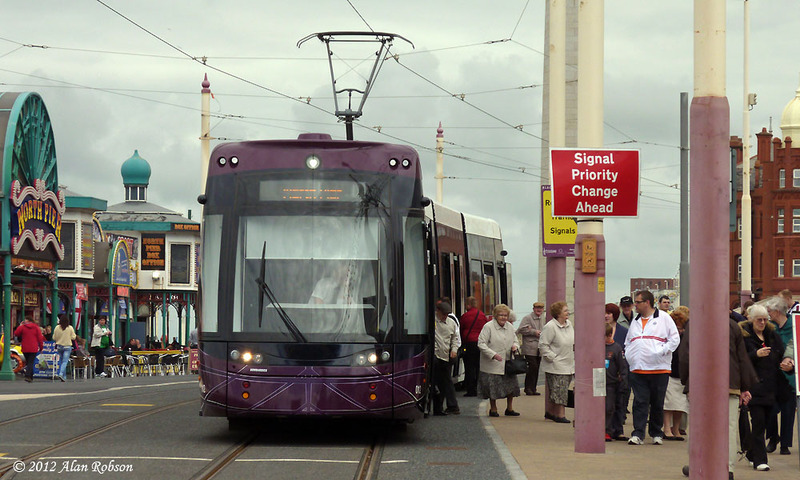 From here the rest of the journey into Blackpool was via the usual relay procession. 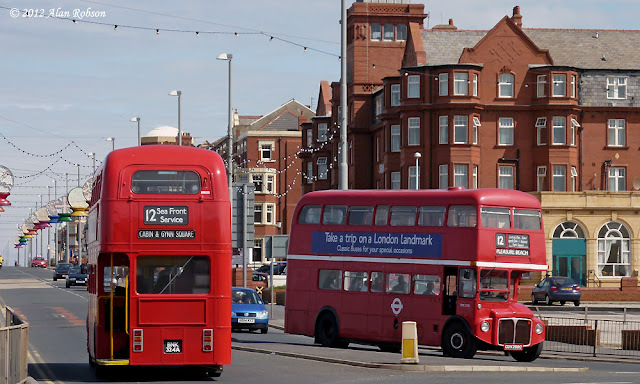 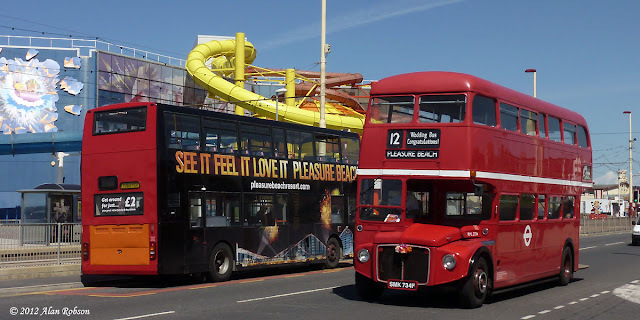 Blackpool Transport aren't the only people running heritage vehicles along the sea front, since the 2nd June London Routemasters have been a regular sight on the promenade. 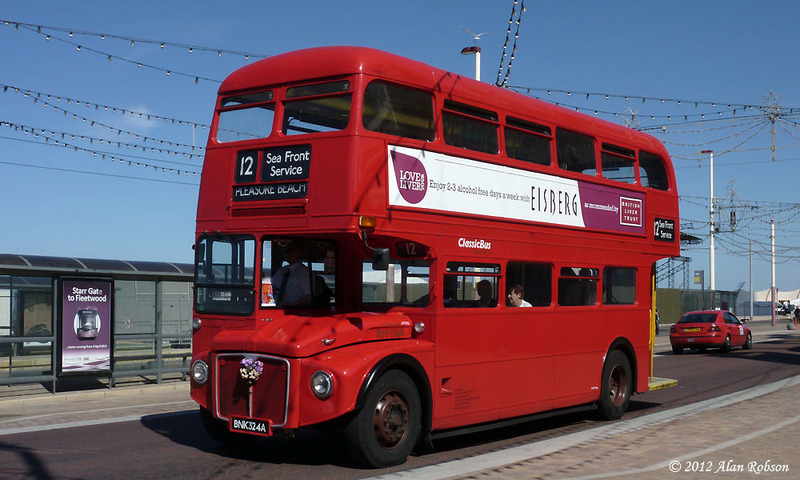 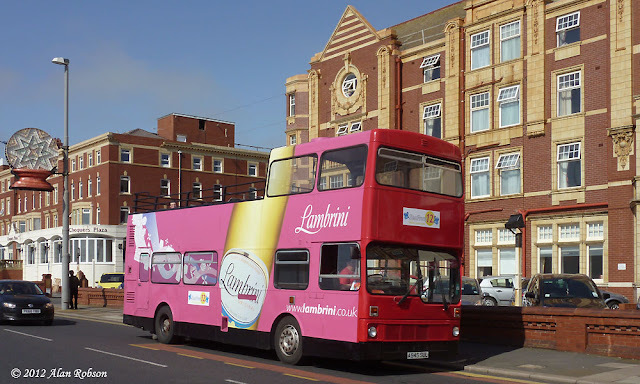 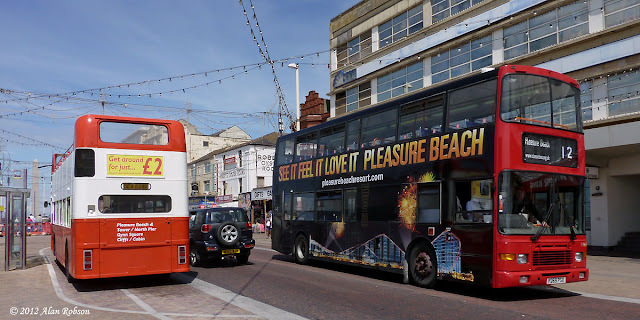 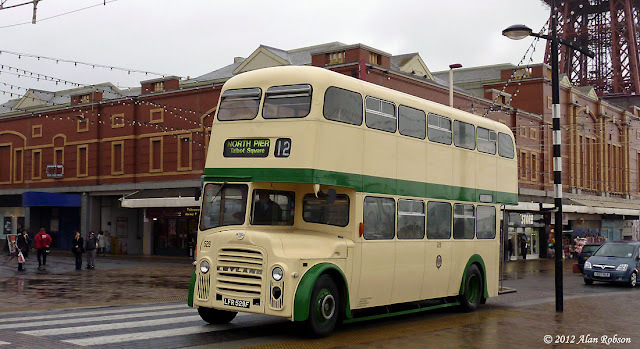 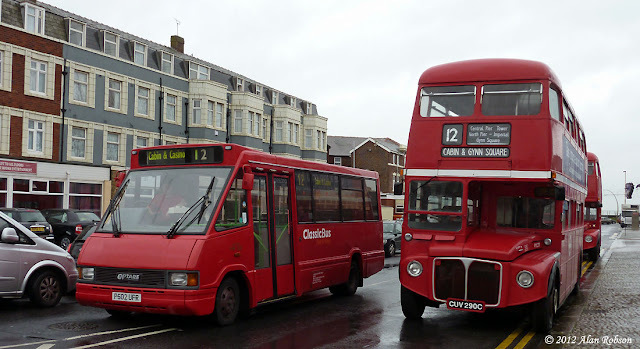 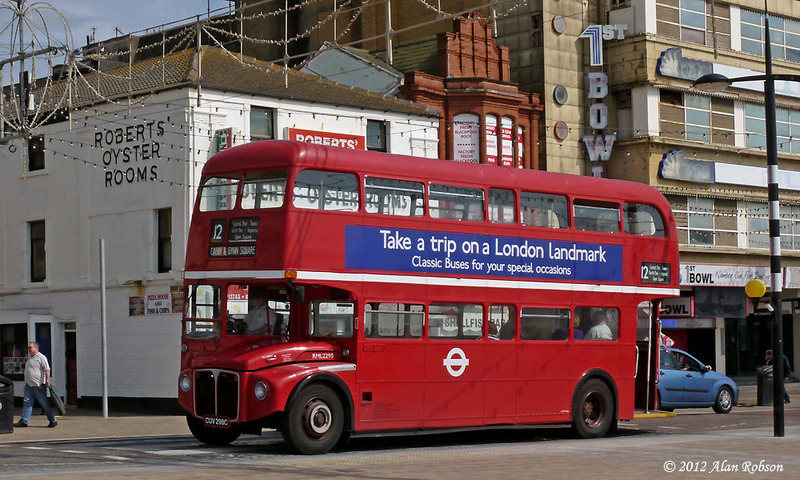 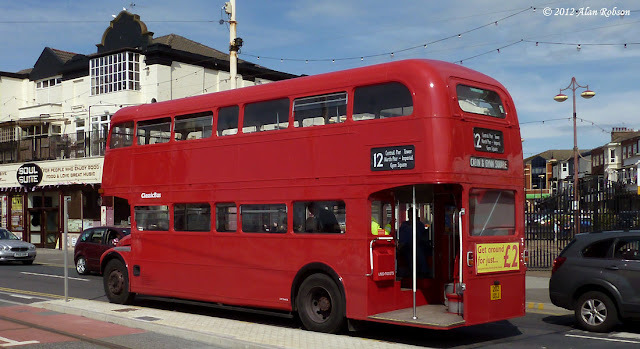 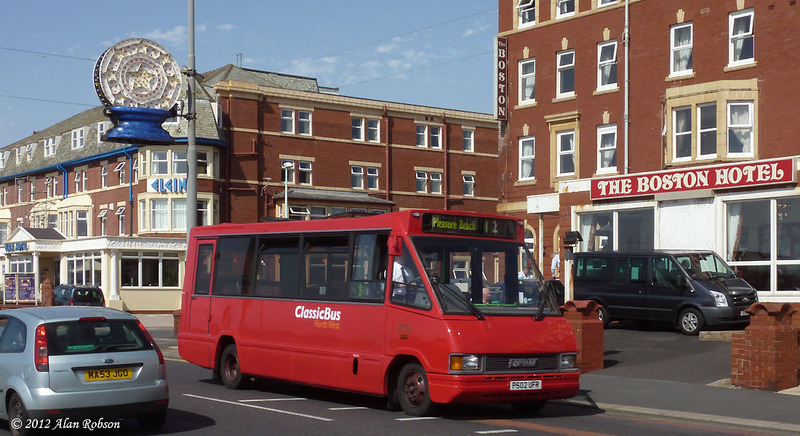 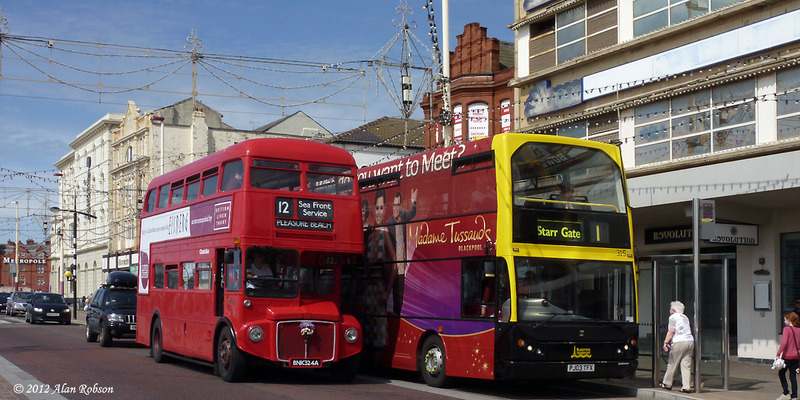 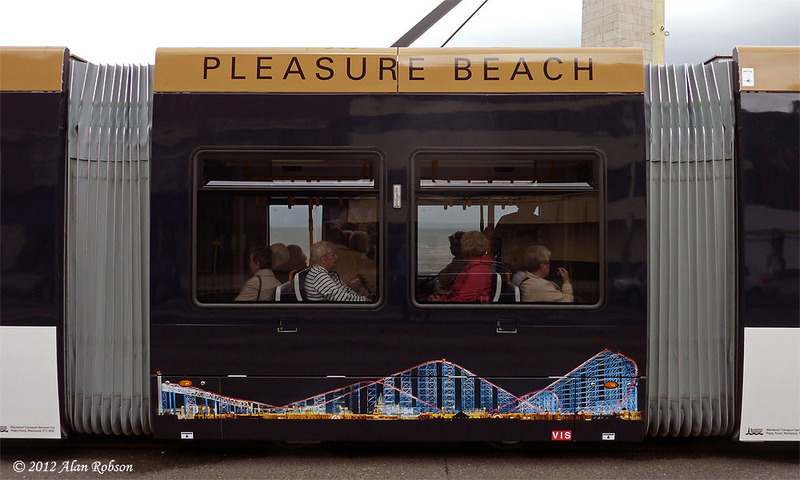 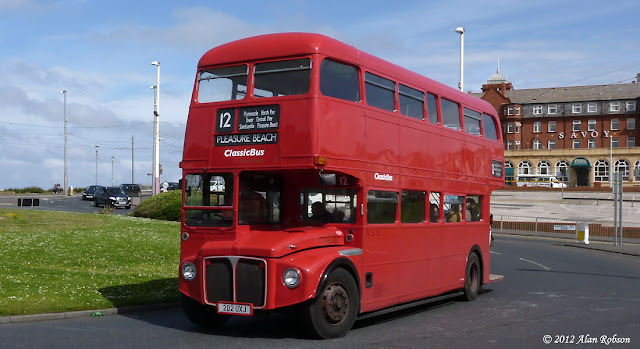 Classic Bus North West have introduced the new Seafront Service 12, which operates between the Cabin and the Pleasure Beach using a mixture of vehicle types, including RM and RML Routemasters, Olympians and an open-top Bristol VR, along with other buses which may appear from time to time. 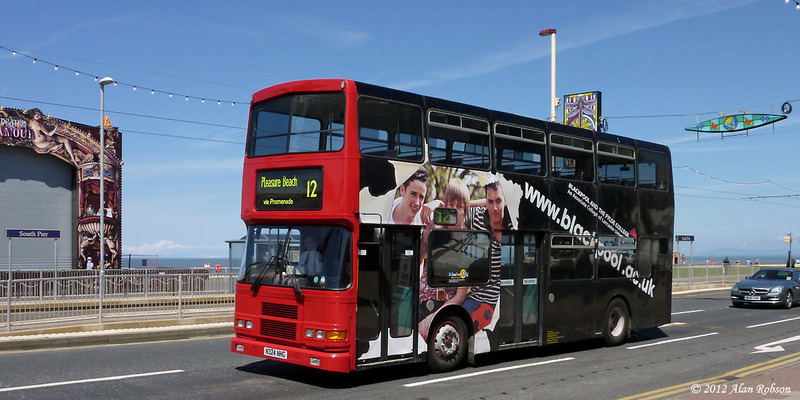 The new service operates every 15 minutes between 0900 and 1800, and is already proving popular with visitors, with many being seen having their photographs taken in front of the classic red London buses. 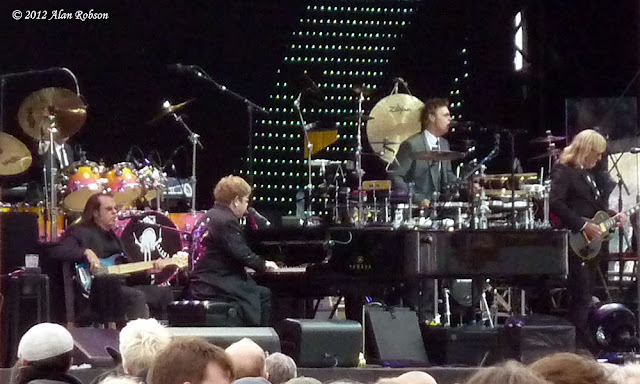 On Saturday 16th June, the Tower headland saw its first use as a concert venue, with Elton John playing to a crowd of 11,000 people on a specially constructed stage. 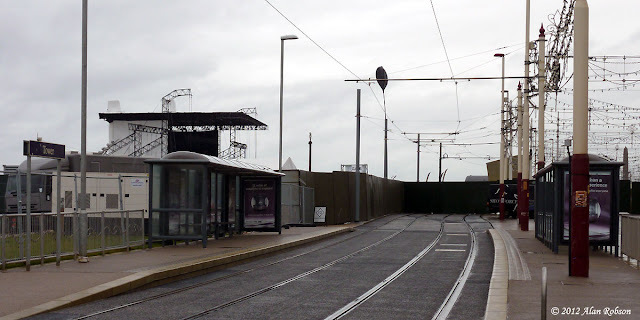 As the temporary seating for the concert went over the tramway and road, this was obviously going to cause some travel disruption over the weekend. 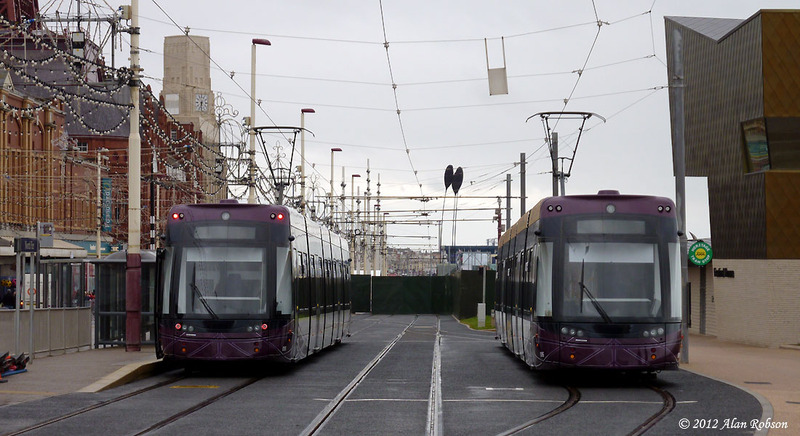 From late Friday evening until Sunday afternoon, the tramway operated in two separate halves. The northern section operated from North Pier to Fleetwood Ferry, while the southern section shuttled between Starr Gate and Manchester Square (turning at Foxhall). 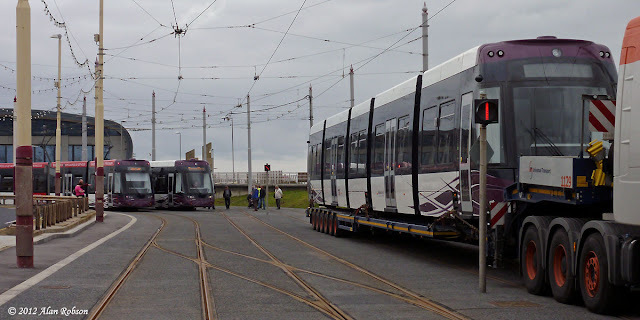 This operation saw as many as three and four trams at a time together at North Pier, and at times all three tracks were occupied adjacent to the southbound North Pier stop, near Festival House. This bottleneck meant that some southbound trams had to unload their passengers adjacent to the North Pier entrance, well short of the platform which was occasionally occupied by another tram. 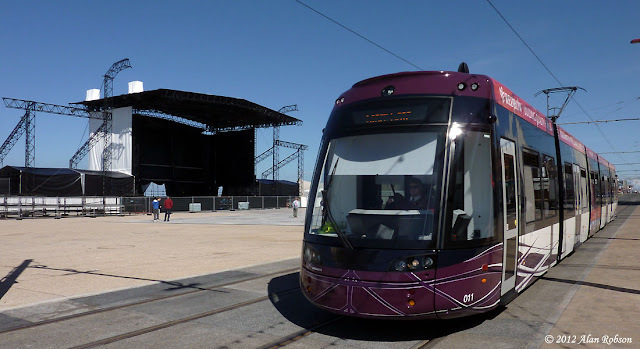 The disruption to the tram service lasted until Sunday afternoon, as the clearing of the concert seating had been delayed due to the poor weather over the previous night.